The CALCULATE function is the most important one in DAX. This blog shows you how to use it to replace, remove and amend the query context for a measure (and also explains what this sentence means!). The previous part of this blog showed how to remove filters altogether from the query context; this part shows how to keep a filter, but change it. We're showing sales for any cell as a percentage of the equivalent sales for the South region. The South column necessarily always equals 100%. 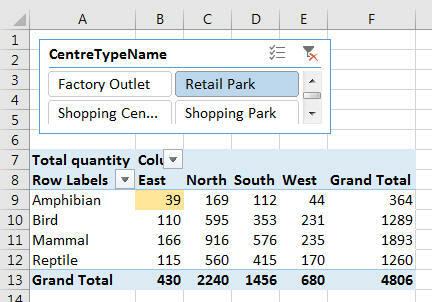 The 34.82% for the East quadrant shown shaded in the pivot table at the top of this page equals 39 (the figure for East quadrant amphibian sales for Retail Park centres) divided by 112 (the figure for South quadrant amphibian sales for Retail Park centres). The tuple shows we're changing, not removing, the quadrant filter. Adding a filter to a dimension for the CALCULATE function thus destroys the previous query context for that dimension.